Looking for a USED MB-10000H? 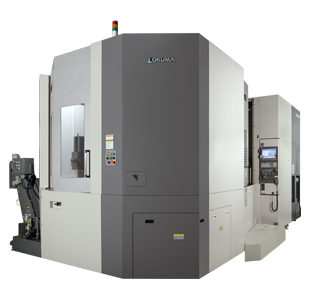 The Okuma MB-10000H is a 1,000mm (39.4”) square pallet size horizontal cnc machining center. Its core features include standard double ball-screw drive, ball-screw cooling, box in box construction, center trough chip handling, thermal compensation included for all spindle choices and much faster motions for a machine in this size class. All elements combine to produce the most efficient and convenient horizontal machining center available for milling, boring, drilling, and tapping. This HMC is a solid production engine; for everything from the basic through FMS applications. Looking to Purchase a New OKUMA MB-10000H?